Welcome aspiring students! The Emory QSN Chapter is home to one of the largest chapters in the nation, with nearly 300 students making up our community. Officially recognized by the university, our chapter continues to strengthen the socioeconomic diversity of the Emory campus by collaborating with other student-led organizations that emphasize the relationships between low-income Scholars. In addition, our faculty advisor, Dela Sweeny, is acclaimed around the university for his work as the Director of the Office of Multicultural Programs and Services, as well as his role leading the Center for Diversity and Inclusion. Our chapter is well connected to a variety of resources throughout campus. Most notable is the close relationship we have with the admissions office. Our scholars are on a first name basis with many admissions officers, and we regularly invite them to the many events we host throughout the year. Additionally, our work with the Career Center allows Scholars to have direct contact with staff who specialize in resume crafting and internship seeking. For those who prefer advice from their peers, our chapter hosts a Quest Mentoring Program that offers direct one-on-one mentoring between a first-year student and an upperclassman. Upon arriving to Emory, the QSN Chapter hosts a huge Welcome Event that welcomes first-year students and returning upperclassmen alike. It allows both groups to get acclimated to the year ahead and provides a great opportunity to form friendships within our large chapter. Our chapter also started an Annual Induction Ceremony several years back. This formal event held each fall regularly hosts some of Emory’s most celebrated staff as they impart wisdom upon QuestBridge Scholars. 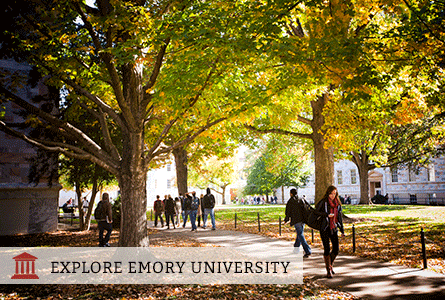 We hope that you continue to research this fabulous university, as we all feel our decision to attend Emory has truly been life changing.